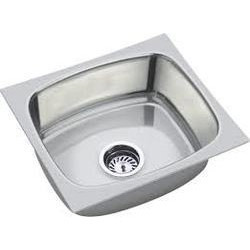 To furnish the diverse requirements of our clients in best possible manner we are engaged in offering a wide range of Kitchen Sink. These are using optimum grade stainless steel and advanced technology to meet the variegated preferences of our clients. In addition to this, we also assure to deliver our products in a stipulated time frame. Established with a motive to cater to endless desires of customers, we, Deco Impex, have put an enviable presence in industry in the year 2012. By maintaining quality in products as well as reliability in services, the company has achieved success within very short period of time in industry. Our company is a partnership owned firm and is engaged in trading, supplying and exporting a comprehensive array of Handrail Fitting, Toilet Cubicle Fitting, Bathroom Accessories, Glass Door Fittings, Kitchen Fitting, Stainless Steel Screw, Door Fitting and Decorative Lighting. Also, we are highly acclaimed for offering trustworthy Wall Art Work. Our products are sourced from the highly reliable vendors, who specialize in developing these products as per the challenges taking place in industry. They are aware of the customers’ preferences and thereby design products accordingly. We export our products in middle east and other countries.